All of the products contain circulation quality William McKinley Presidential $1 Coins. Despite being struck to circulation quality, none of the coins have actually ever been in circulation. The pricing above does not include the US Mint's standard shipping and handling charge of $4.95 per order. The US Mint charges an additional $7.95 for each 500-coin box ordered due to their increased weight. The William McKinley Presidential $1 Coins are the first of four 2013-dated strikes to be issued in the Presidential $1 Coin Program. The series debuted in 2007 and features four new released annually each honoring a former President of the United States in the order in which they served. William McKinley was the 25th US President. His portrait on the obverse of the coin was designed and executed by United States Mint Sculptor-Engraver Phebe Hemphill. Obverse inscriptions surrounding the design include WILLIAM MCKINLEY, 25TH PRESIDENT, 1897-1901 and IN GOD WE TRUST. "William McKinley was born in Niles, Ohio in 1843. He served in the U.S. House of Representatives for 14 years and two terms as governor of Ohio before becoming President in 1897. He served one full term and was re-elected in 1900. President McKinley was shot by an anarchist in September 1901, while attending the Buffalo Pan-American Exposition and died eight days later." 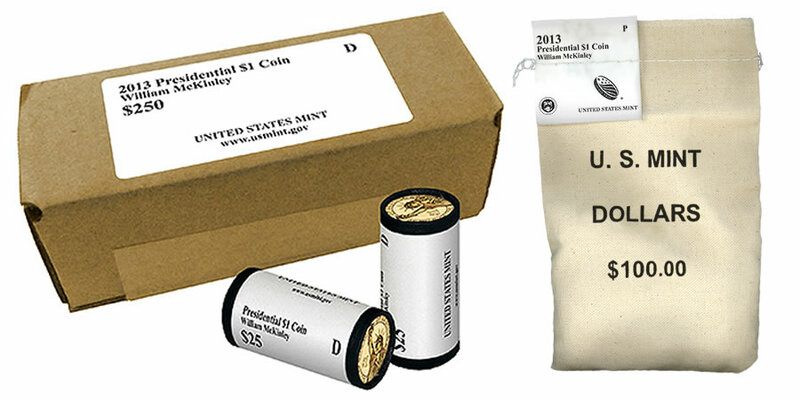 Orders for the rolls, bags or boxes of the William McKinley $1 Coins may be placed directly with the US Mint.Orders are accepted via the Mint's online website of www.usmint.gov or by calling 1-800-USA-MINT (872-6468). Hearing- and speech-impaired customers with TTY equipment may order by calling 1-888-321-MINT (6468). Of interest, last week, the US Mint released the 2013 Presidential $1 Coin Proof Set which contains a proof quality example of each of the 2013-dated Presidential $1 Coins including a William McKinley $1 Coin.